I had about a cup of black beans that I had left on the countertop for sprouting. I usually leave a few different kinds of beans now and then to sprout. 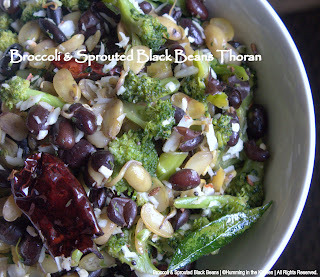 One evening when I got home from work, Amma had made this lovely broccoli thoran (stirfry). Along with rice, pulisseri (a yoghurt based South Indian Curry) rasam & papads, it was a lovely dinner. With parents here, we sure are getting pampered. Sprinkle 1/4 teaspoon salt and turmeric powder on the sprouted beans and toss well to coat. Steam the beans for 8 to 10 minutes to cook them. We use our idli plate for all kinds of steaming. Meanwhile, add oil to a pan. When sufficiently hot, add the mustard seeds, cumin seeds, dry red chillies and curry leaves, fry for a minute without burning. Once the seeds are done spluttering, add the broccoli florets. Sprinkle some turmeric powder and salt, sauté for a couple minutes. Turn the heat down, cover with a lid, allow the broccoli to cook for a couple minutes. We like broccoli crispy and about 3/4th cooked. If let alone, broccoli could get pretty soggy. Check in a minute or two to make sure it is done to your liking. When the beans are steamed enough, remove them to the pan with the broccoli. Mix it well and heat for a couple minutes on medium heat. 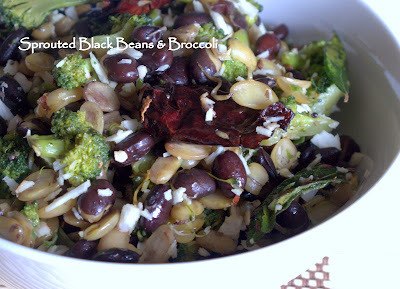 The moisture from the beans will help cook the broccoli further. Remove the pan from fire and set aside. In a blender/mixie jar, add the grated coconut and green chillies, pulse for a couple times. Add this mixture to the pan and mix well. Transfer to a serving bowl, enjoy with your loved ones. I think cauliflower would be a good variation for this dish too. This is my amma’s own instant & original recipe. Sending it to Lore’s Original Recipes round up. Also sending it to MLLA 14, hosted by Susan, the brain behind the popular event. 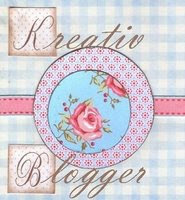 The very creative ladies Sadhana & Muskan have passed me the Kreativ Blogger award. Thanks very much gals, I deeply appreciate your encouragement. This dish is a childhood favourite of mine. This savoury snack is regularly made in Palakkad Iyer households during Navrathri season as a neivedyam (offering to the diety). Navarathri was very much looked forward to during my school years in Palakkad. Nine festive days of getting dressed up in the evenings wearing pattupaavadai, long silk skirts with lovely golden trim, hair in pigtails adorned with fragrant mallipoo(jasmine), roaming the agraharam street with two of my friends. Among the two of them, they were best friends the first ten minutes and bitter foes the following ten minutes. This was a never ending cycle and my role was to listen to both ends of the argument and be their mediator. Most of the days during Navarathri, the hour long trip ended when we made it back home with our loot after visiting each of the households in the agraharam. Our loot consisted of all the yummy goodies from all the houses we visited. It was indeed a treat with the variety of snacks all mixed up. We would still continue our chitchat session in front of one of the three houses until an adult showed up, scolding us that it was getting dark. Moving on to the recipe :) I love to make this dish in the evenings. My daughter absolutely loves to snack on these soft pearly white balls after school. 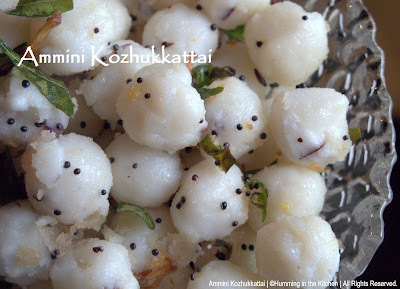 On working days, I usually have the kozhukattai balls steamed and ready before I leave to work. All there is left to do in the evening is the tadka/tempering. When the water starts boiling, add the minced coconut pieces. Now add the rice flour half cup at a time, stirring quickly and uniformly so that no lumps are formed. Add all the rice flour gradually and keep incorporating all of it, without forming lumps. Reduce the heat to a medium while doing this. In a couple minutes, the rice flour would get half cooked, and becomes a solid mass. Remove from fire and allow it to cool, about 5 to 10 minutes. Once the rice dough is cool enough to be handled, make tiny balls out of it using oiled palms. Steam these rice balls for about 8 to 10 minutes in a steamer. I use an idli cooker for all my steaming purposes. Remove the steamed balls from the steamer/cooker and set aside to cool. In another wide pan, add 1 tablespoon oil for tadka. When it is sufficiently hot, add the mustard seeds. After the mustard seeds splutter, add curry leaves and the chopped green chillies. Fry for a couple minutes without burning. Add the hing and mix. Remove the pan from heat, add the steamed rice balls and mix well. 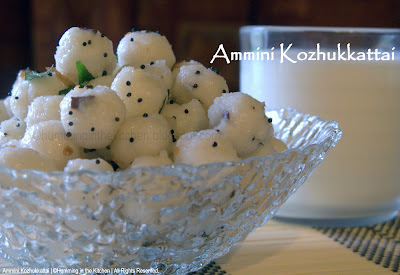 Ammini Kozhukattai is ready to be snacked on. With milk, it fills up my little one just right until it is roti time at night. This is my entry to Cooking for Kids, a monthly event started by Sharmi of Neivedyam, hosted this month by Divya. The theme Divya has chosen for this month is evening snacks. Here is Divya's announcement, here is Sharmi's original announcement of the event. I read about the event Steamed Treats, started by Shruthi, from Divya's blog. This dish also goes to Shruthi's event. Sangi from Simply Delicious has passed on the Kreativ blogger award to me. Thanks so much for the encouragement Sangi. I am truly touched. I would like to pass this award to all my blogger friends. I have been discovering new and creative blogs by the day. It is so much fun to meet foodies and talk about food! Working mom of a bubbly 7 year old. Me and my loving husband are originally from Kerala. We enjoy cooking together and generally love to hang out in the kitchen. I absolutely love sharing ideas and meeting people; if you find my posts interesting, don't forget to drop me a comment! I AM A DARING COOK! Add this blog to your Technorati Favorites! Please note that all text and photographs in this blog, unless otherwise mentioned, are copyright of © Humming in the kitchen. Please do not reproduce without explicit written permission.